Love in (most) all forms – from self to romance to heartbreak – explored through poems including: mis-quote from (probably not) Jack Kerouac, Khalil Gibran advising his son, Mary Oliver reminding to trust, (Angela) Anaïs (Juana Antolina Rosa Edelmira) Nin’s recklessness, Leonard Cohen recalling flowers to a shy lover, Katie Buemann picking up a sword – plus a variety of relevant freeverse and haiku by myself – while Jerry Garcia describes a Wonderful World and Tanya Donnelly pines for the Atlantic. Two separate things happened on August 9, 1995, both by chance emerging from Northern California though they had little else in common. The first was a scheduled event: the initial public offering (IPO) by Netscape, a startup tech firm designed to make software to power the Internet. Jerry Garcia. This one hit home. Nobody said “going viral” yet by the summer of 1995, but that’s exactly what Jerry Garcia’s death did, and it was pretty much the biggest anything had gone viral anywhere up to this point. Jerry Garcia’s death was the first major spontaneous news event to break big on the Internet, and the first of many to follow. There is one simple reason why it took a Grateful Dead member’s death to inspire the world’s first flash mob: the Internet’s early-adopter user base was heavy with educators and scientists and technologists, and educators and scientists and technologists tend to love the Grateful Dead. There was also a remarkable preponderance of Deadheads at magazines like WIRED as well as among the Internet’s most well-known early voices, like lyricist John Perry Barlow, who had recently emerged as the co-founder of the freedom-minded Electronic Frontier Foundation. It’s because the World Wide Web and the Grateful Dead loved each other so well that August 9, 1995 turned out to be the first day I ever used the Internet to find out where I would be going that evening. This day was pivotal for me and the day *everything* changed for me. I was a Deadhead and living on th e island of Guam after leaving Japan for a visa run and, after finding i was somehow very employable, i stayed on. Then, 1995 came and instead of joining my pals from BC, Canada and Utah and all points in between, i figured i’d work one for season as a Japanese speaking host at a private beach club – which sounds like a dream job but i could feel my brain atrophying and i’d imagine myself 20 years later as a character from a Jimmy Buffet song…And then in the weird time shifted hours of a 17 hour difference, i got the call that Jerry died. I was crushed and flummoxed and didnt go to work and instead starting making calls to find out “what happened? when’s the tribute? what the fck?” etc. I couldnt learn a thing and the newspapers operating on a day or two delay was no help – of course this hippie didnt have a TV and then again, watching some make-upped clown on CNN tell me the generic anecdotes was not what i needed. So i went down to a park where i thought i might find some other Heads and sure enough, i found tribe of wide-eyed wonderers in the same state of mind. I realized there was no way i could physically get from Guam to San Fran in time for any memorial and instead tried to call friends who i’d roust at 3AM and barrage with questions quickly as i was paying like $8/minute or something. Still no real sense of understanding so i went to an ISP called Kuentos.Guam.net and took a one night workshop to connect to the internet using Win 3.1 and Trumpet Winsock. I couldn’t have cared less about the tech but wanted to see the words and pictures… and over the 9600 baud modem, i began to see Dead.net appear with words and pictures. The page was about 1/2 way loaded when the power went down on the whole island after a (endemic & invasive) brown tree snake bit into the one of the warm electric wires and shut it all down. I had seen the future enough to know that this was something for me. Since i was a kiddo, i’d made ditto-machined newspapers, punk rock fanzines, the best school reports, and shared little chap-books of poetry and sketches with pals and now, i realized, i could do this at a bigger scale… take all my weird bits of knowledge and share with a larger audience. Head melted i started my first web page a week or so afterwards, a treatise and clearinghouse about the history of Hemp in Japan. The page was endlessly long as i didn’t realize the concept of multiple pages linking together but like the endless scroll feeling of the page — mountains and rivers without end, its seemed organic and right away, there was conversation and community sparked as i quickly met other folks exploring nascent hemp culture. Within a month, i was importing hemp surf trunks and trucker wallets to sell on island and also sending my research out to publications. Realizing the my lifestyle/hobby of the Grateful Dead was no more (ostensibly anyhow), i made plans to leave Guam and head to Olympia Washington where i could mop up a long overdue college degree and find a place in all of this new web stuff. Within 24 hours of landing in a strange climate and town, where i set up a tent in the woods by Evergreen College, i met some heady looking guys setting a booth to sell tie-dyes the next day at an annual campus fair. I asked them for change for the laundry and they asked “are those hemp overalls?” Yeah man,… of course this led to the usual passing of the bowls and swapping tales of tour. The next day i learned they also had just opened an ISP called OlyWa.net. “Come on by,” they said. I did and joined up and crashed coursed myself in TCP/IP, POP, PPP, HTTP and all the other acronyms i could and, seeing the 3 dudes werent exactly “people persons”, i worked my way into the biz as the marketing guy. This was a wild great ride from 1996-2000 when we sold it (a whole other story including the acquiring company requiring me to take a drug test… they tried anyhow). Then moved back up to Vancouver, working for Raincity Studios making new-school database driven content rich, community building sites, Warner>Rhino was a client and was able to do some work on the site which brought me to the Internet in the first place. I added my fuzzy photos and hazy memories to the list of shows and felt something about full circle. Also by this time, my first web project about hemp in Japan had been published extensively and i had High Times staying at my house and related fun and chaos. Then, moving on i was the first Marketing Head at Hootsuite – a social media tool in full startup mode. We were 10 in a dingy office and i was charged with growing the audience with basically no budget. But years of hustling the Grateful Dead lot and making enough to get to the next show and have a good time doing it, came in handy as i recruited an international team, fed them stories and together built community around our users including epic campaigns at SXSW where i went back to my Dead roots and created the Hootbus which was a modified short bus turned into a party on wheels as we’d roll the streets of Austin getting people “On the Bus” just like on tour — well kinda anyhow. In my barrage of public speaking which came along with the ride, i shared stories (to tech heavy audiences) of building community on tour, the resourcefulness needed to build and move, the “one hug at a time” ethos which i espoused to treat each user like our favourite. Then last year, The Grateful Dead did the 50th anniversary shows and Hootsuite reached a Billion dollar valuation. Im still the same guy, sitting on a porch with a smoke and cut off jeans wondering when the next show is and how i can share the story. My good buddy Mac Kobayashi runs a small farm in Okayama, Japan (really my fave all around place in the country as nice mix of city/country, beach/mountains, trad/modern culture) making goat cheese/milk and serving delightful craft bevvies and meals. He also has a truly epic music collection, especially Grateful Dead related, but also Allmans, Phish, String Cheese… as well as Americana galore including Wilco, Ry Cooder, Townes Van Zandt, and poets Leonard Cohen, Bob Dylan, Elliott Smith and Courtney Barnett, and more and more and more (!). I (not shockingly) especially enjoy the GD box sets and books as i see them advertised but never had chance to look/listen/touch myself… until his farm. Such elegant collections in wooden boxes, suitcases and curious box sets. Plus dang near every book ever about GD. I rounded-up a few snap selection (but not all by any stretch) for my amusement and by-association-collection and invite you to look along. Includes the Europe 72 suitcase pack, the set with a show from each year + 7″ single from 65/95, a stack of books, a set from Fare Thee Well, some backstage passes stuck on coffee cans, and also a photo of the charming farmer himself and some of his happy animals. If you are ever rambling in Japan, i advise a visit Rural Caprine Farm (+ Rural Caprine Farm on FB, Insta, Twitter) to listen to some selections and enjoy a goat milk latte. 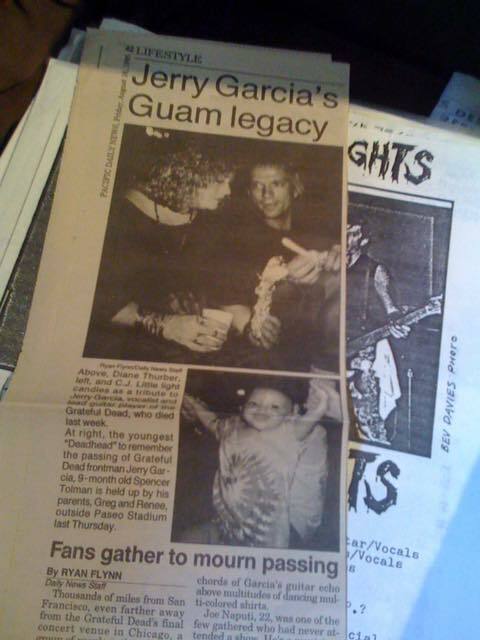 #Guam (and me) and Jerry Garcia were in the Pacific Daily Newspaper on this day in 1995. Joyous Hockey Day in Canada! Shortly after New Year’s Day, Uncle Weed recounts highlights from the passing year including a surprising visit with bong-toting ice fishermen on a frozen neighborhood lake, plus recaps on concerts, spreading messages to media and youth, voting often, speaking out, supporting soldiers and peaceniks, resisting cynicism, researching the painter Varley, publishing literature, sparking coverage of Olympics, making a board game, gallery visits, riding the new SeaBus, remembering ole dead gramps, drinking stout and earl grey tea, and the joys of treading on thin ice.